Who doesn’t love a good puzzle? The sensation of cracking a real brain-buster is an unbeatable endorphin hit. Proving that you are as diabolically brilliant as the evil genius who made your favorite puzzle game is as big a reward as any in-game achievement. Puzzlers also tend to be flexible. Say you want the convenience of Android or iOS puzzle games. Pick your platform and prepare to pit your puzzling skills against our pick for today – Xcube. What is Xcube all about? 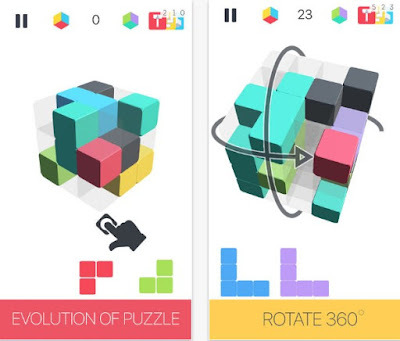 Xcube is one of our favorite puzzle games on both Android and iOS platforms. We love its smooth design, its colorful graphics and its one-of-a-kind gameplay that can challenge anyone to the fullest. Basically, it is a rotatable Tetris/Rubicks based cube game for users of any age. Let’s talk more about the gameplay and the rules. This is one of those addictive puzzlers that are easy to play but hard to master. All you have to do is fill a 360 degree rotatable cube with the given objects, fill a horizontal or vertical line and see it destroyed. Clear sides of the cube to place new shapes and be careful when clearing, always leave area for incoming shapes. By destroying lines you earn points until cube is filled and there is no place for the incoming objects, then you lose the game. The game provides with a harder mode as well – the Rubicks (or Color) mode where your objective is to fill the color based faces with the matched color. But be careful when you add shapes into one corner, you are blocking another side of the cube. You need to solve your own puzzle, you can choose colors and themes, you can personalize your cube, etc. If you want to enjoy this unique next generation puzzle game, click one of the links below and download it for free. Make high scores and don’t forget to challenge your friends!